Thanks to Anne Newman for sharing her writing on this fascinating saint. St. Piran (Cornish: Peran, Latin: Piranus) was born in Ireland in the 5th Century. After studying the scriptures in Rome he returned and was made a Bishop. In Ireland he was said to have performed many miracles, such as raising from the dead soldiers slain in battle. But the Kings of Ireland at the time were not impressed and they flung St. Piran into the sea with a millstone around his neck, because they were jealous of his healing powers. St. Piran miraculously floated across the water and landed at Perran Beach in Perranporth. It was here that he built a small chapel amongst the sand dunes whose remains can still be seen today. The chapel was unearthed from the sands in the 19th century, and the skeleton of very tall man discovered. The chapel was reburied to protect it from vandals. His first disciples are said to have been a badger, a fox, and a bear. People would come from miles around to hear him preach. Traditionally, St. Piran has been identified as the Irish saint Ciaran of Saigir. The 14th-century Life of Saint Piran is a complete copy of an earlier Middle Irish life of Saint Ciarán of Saighir. The names Piran and Ciaran or Kieran are identical - p in Britain being the equivalent of the Irish k. The history of the two saints is, in the main features, the same, although the Irish lives of St. Ciaran do not record his migration to Cornwall. St. Piran is said to have "discovered" tin when his black hearthstone became so hot, tin began to melt, forming a white cross on the black stone. This knowledge gave the local people work and the Cornish tin industry was born. 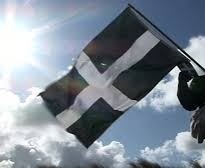 The Cornish Flag, the Flag of St. Piran (white cross on a black background), represents white tin flowing from the black rock, or good overcoming evil. Hence, St. Piran is the patron saint of tinners. St. Piran is believed to have lived for over 200 years. He was fond of a drink and they say he met his end falling down a well on his way home after a party. Processions are held in several towns, including Redruth, Truro and Penzance. The largest St Piran's Day event is the march across the dunes to St. Piran's cross, re-enacting St Piran's arrival in Cornwall from Ireland. Hundreds of people attend, dressed in black, white and gold, and carrying the Cornish flag. During the late 19th Century modern-day Piran’s celebrations were started by Celtic revivalists to provide people with a national day of celebration. The churches at Perranuthnoe and Perranarworthal were dedicated to Piran and holy wells at Perranwell and Probus are named after him. Mount St. Piran is a mountain in Banff Nationa Park, Alberta, Canada, and it was named after St. Piran in 1894 by Samuel E.S.Allen. St Piran's crab, Clibanarius erythropus, a small hermit crab found in Cornwall was named in his honour, in 2016. This Somerset Wildlife Trust video on Youtube tells it's wonderful story. St Piran is one of three Patron Saints of Cornwall. The other two are St Michael and St Petroc. Michael is associated with St Michael's Mount and St Petroc with Padstow. Cornwall's St Michael has his own feast day celebrated on May 8th, and St Petroc is 4th June.